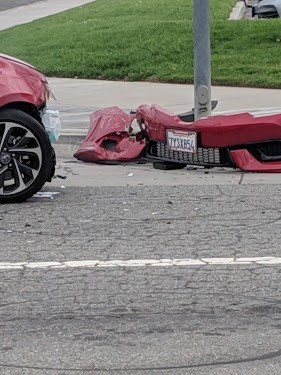 A car accident today in our red car on the way to dialysis. Victor was driving. I have no idea what happened because I was playing a game on my phone, looking down. All I got was the crash. We were hit by a young man who was wearing a Concordia student outfit, who also hit another car after he hit us or in the middle of hitting us. Victor was making a left hand turn across an intersection. He says all he saw was something came from the right suddenly and there we were spinning to the left. He had his foot on the brake and we got stopped before re-entering traffic on Redland’s Blvd. 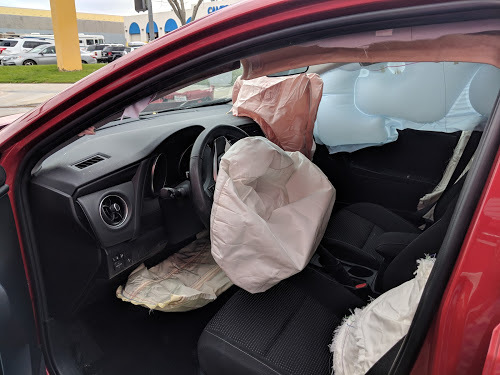 The car’s airbags deployed. We had a Sheriff pull up on us as I was getting out of the car. They helped Victor get out of the car. His door would not open properly and he only had a small space between the airbag and the door frame. His artificial leg made it awkward. I got out of the car quickly grabbing my purse and dialysis bag, as well as my cane. My phone was still in my hands. We were moved over to the curb for safety. I took pictures of the cars involved. 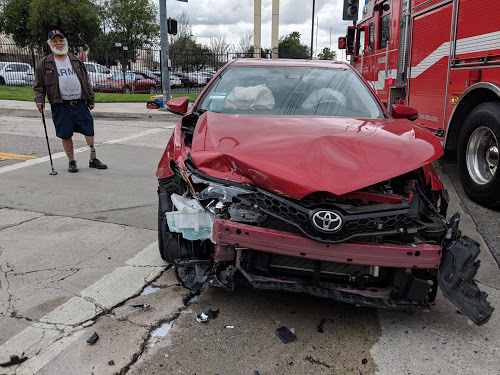 Paramedics were called because our airbags deployed. The fire department moved the car to the side of the road. The community liaison from the SB Police came and took reports and made sure everyone had shared insurance and names. Victor stayed with the until it was towed. The tow truck driver brought him home. My dialysis center director came in her car and brought me to the center from the accident site three blocks away. I am bruised on my left hand and arm, plus down my right hip from the seat belt. I ache, but then I ache all the time anyway. We are all right, just going to be sore for a few days, plus dealing with the aftermath of having our car hit. Victor with the smashed car.